First a little disclaimer: I know I am quite late to write this post, already a week has past since the BIG day. But still it is better late than never, Right? Now what was IT-Niketan? It all started from a Facebook group. One day a few persons were discussing what if we had a common platform where all the developers,designers and testers of kolkata could meet and discuss things. And as facebook discussions go, this went for sometimes then just faded. But from that discussion one person took notice. Aninda da liked the idea, he took it to a much greater platform. The NASSCOM. He was with the nasscom so he placed the idea there and it was approved. And thus the inception of IT Niketan. It was scheduled to take place in the DPSC Auditorium in saltlake and when I reached there it was already in full gear,just about to start. First we had a little introduction and keynotes session by Mr. Suparno Moitra (Regional Manager East NASSCOM) and Mr. Rajiv Vaishnav (Vice President NASSCOM). Then came the big moment. It was the time to take the stage for Bibhas,me and Sagnik. There were almost 120 people in-front of us among them most are highly experienced persons and we were supposed to talk about a day in the life of designer,develper and tester infront of them. Bibhas took the stage first, started the talk beautifully taking reference from the video IT-Niketan uploaded in youtube and explaining why the work of a professional is not only head banging over problems. Then came my turn. I took the mike, blabbered for almost 20minutes (don't even remember half of what I said) and then handed it over to Sagnik. Sagnik finished it for us and Bibhas again took the mike for a last punch and then we were over. And to our surprise the response and clapping we got was not bad at all. Next was a telephonic presentation by Govind kulkarni and then a session in testing by Mousumi Dharchoudhuri from IBM. Then came a very very interactive and interesting session by Sherman Jackson and Anindya Mukherjee about designing. Loved the session of Anindya da more though. It was followed by Arijijt Das Gupta (IBM), Uday Shome (Cognizant),Manavesh Ghosh (cognizant),Rajiv Popat(eForce). I liked each of them, they all seemed so much knowledgeable in their own spheres. Though Rajiv popat And Manavesh Ghosh were my favorites. I really hoped he would continue his session on Real Time Web Programming a bit more, it was just getting interesting when he cut it short for the time constraint. But the person who really set the stage ablaze was the last one, Mr. Sudip Majumder (Vice President, Oracle Corporation). The kind of experience he had and the stories ha shared with us seemed surreal. It was inspiring to see such a person and hear what we can achieve. After that it was just the thanksgiving, and me,bibhas and sagnik all happily bagged one memento for our lectures. Thus came the end of a wonderful day. 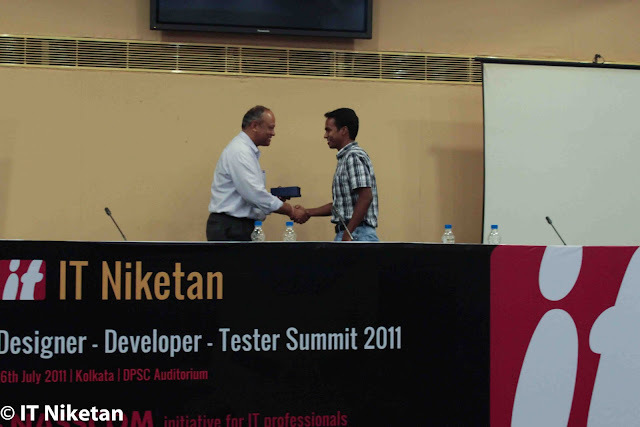 Got to meet some wonderful people, got to interact with some of the brightest minds and came home with lots of expectation from IT-Niketan for future. This summed our day. The album Aninda da put online can be viewe here or here (mine). View more presentations from rabimba.